This is a classic from Takashi Amano's ADA. I don't actually know the specific name of this tank, other than the designation of "ADA 26" but it sure is beautiful. I've had a look through the Nature Aquarium World books and haven't found it, so I'm going to stick with "ADA 26" unless someone else can find a proper name. The shape of the layout here is so dramatic, and the contrast of colors and leaf shapes is amazing. The natural "valley" in the middle of the layout draws attention while the bright green on one side and the red on the other keep the eyes busy. 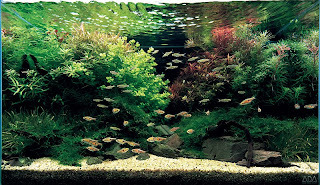 I personally love sand-foreground tanks, and tried one myself, but it's just a pain to keep clean in a long term tank. This aquascape proves without a doubt that Amano is a master at the art form.